"Elkpelt, Jayfall, Warblercloud!" cheered Twonest for his new denmates. Dodgeshade padded into the ShadowClan camp, carrying cobwebs in his jaws. He made his way into his den, placing the cobwebs into the storage. "I, Copperstar, Leader of ShadowClan, call upon my warrior ancestors to look down on this apprentice. He has trained hard to understand the ways of your noble code, and I commend him to you as a warrior in his turn. Mousepaw, do you promise to uphold the warrior code and protect and defend this Clan, even at the cost of your life?" "Then by StarClan, I give you your warrior name. Mousepaw, you will be known as Mouseflight. StarClan honors you and we welcome you as a full warrior of ShadowClan." Padding forward, Copperstar rested his muzzle on top of Mouseflight's head. Mouseflight licked Copperstar's shoulder, then sat back and listened to the clan call out his new name. "Mouseflight, Mouseflight, Mouseflight!" cheered Falleneagle for the clan's newest warrior. Twonest padded over and took his place at the front of the crowd. "Twonest, is it your wish to give up the name of warrior and go to join the elders?" called out Copperstar once the clan had gathered. "It is." meowed Twonest with a dip of his head. "I call upon StarClan to give you many seasons of rest. Your clan thanks you for your service." finished Copperstar. "Twonest, Twonest, Twonest!" cheered Icewaterfall for his former denmate. Dodgeshade padded into the ShadowClan camp, carrying a poppy head in his jaws. He made his way into his den, placing the poppy head into the storage. Icewaterfall pricked up his ears and padded over to hear what Copperstar had to say. "I, Copperstar, Leader of ShadowClan, call upon my warrior ancestors to look down on these apprentices. They have trained hard to understand the ways of your noble code, and I commend them to you as warriors in their turn. Dustpaw, Bramblepaw, Specklepaw, do you promise to uphold the warrior code and protect and defend this Clan, even at the cost of your life?" "Then by StarClan, I give you all your warrior names." 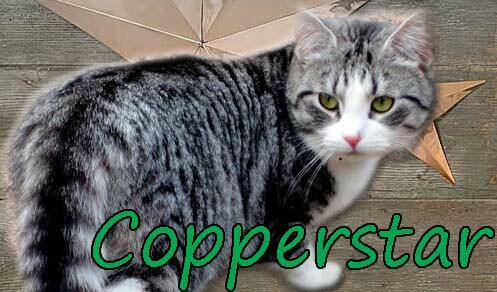 continued Copperstar. "Dustpaw, you will be known as Dustwish. Bramblepaw, you will be known as Brambletail. Specklepaw, you will be known as Specklecloud. StarClan honors you and we welcome you all as full warriors of ShadowClan." Dustwish purred happily to himself as the clan called out their new names. Brambletail puffed out her chest in pride as she listened to the clan call out their new names.